Jim Acosta is a rude, grandstanding individual who thinks he’s God’s gift to the news media. He twists the President’s words continually and is completely obnoxious to not only the President, but the Press Secretary. 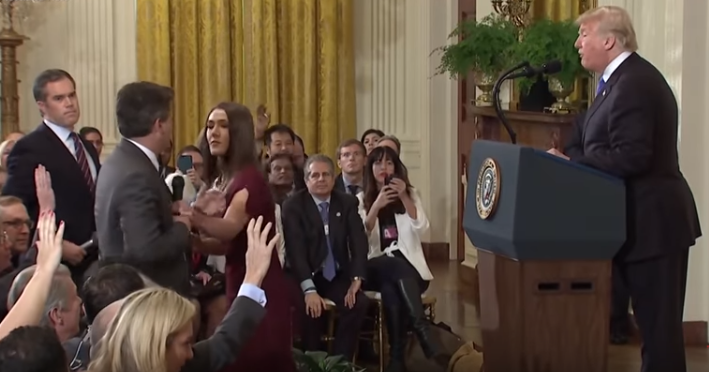 When he touched a White House aide at a press conference as they struggled over the microphone, White House Press Secretary Sarah Sanders revoked his press pass “indefinitely.” Hysteria ensued. Now a judge has ordered that the press pass be restored temporarily, according to Fox. Judge Timothy Kelly, a Trump appointee, issued a temporary injunction against the White House action, with further hearings to be completed on the issue of CNN and Jim Acosta’s First Amendment rights. The ruling stemmed from the 5th Amendment’s lack of “due process” involved in yanking his hard pass. Does freedom of the press mean that the President has to listen to constant harping from reporters even when it’s nasty and obviously politically motivated against him? When everything that comes out of a reporter’s mouth is disrespectful toward every member of the administration? Could be, although the judge has not ruled on the underlying First Amendment issue yet. It’s one thing about Freedom of the Press. It’s quite another to have a low-life scumbag like Jim Acosta as CNN’s representative. Send another person. Give the job to someone else. Send Acosta to Afghanistan and embed him with the troops. Or embed him with the Taliban (my particular favorite) since he thinks he knows everything. The court did not agree with that idea. Unfortunately, the action to remove the jerk’s press pass probably wasn’t going to fly from the beginning. The reason he hasn’t been revoked previously was that his insults and obnoxious behavior weren’t considered a bad enough violation to warrant revoking his credentials. It was the touching of the White House aide that caused the revocation…something the court hasn’t yet considered. When the hearings are complete, we’ll see if that plays into the final ruling. Police officers deserve respect, but courts have held that they have to take verbal abuse, but not physical abuse. Why? Because they are public servants. Insulting a police officer is not a crime, and it’s not likely that insulting the President would be ruled a crime worthy of revoking Acosta’s access. Maybe the touching of the aide will have an effect, but it may not be enough. That same principle likely will apply to the President and his administration. Most of us think Jim Acosta and CNN are a bunch of lying left wing pond dwellers, but the Constitution still applies to them. Drat.